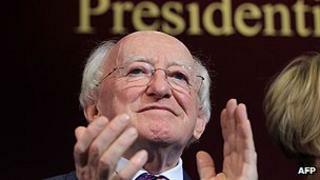 Michael D Higgins, a veteran left-wing politician and human rights activist was elected president in 2011. He also is also one of Ireland's most instantly recognized politicians, in part because of his short stature and much-imitated high voice. Mr Higgins has served as a member of both houses of parliament in the Labour Party at various times, and was minister of the arts in the 1990s. The Irish president wields little power beyond the ability to refer potentially unconstitutional legislation to the Supreme Court, but has an important symbolic role in representing Ireland at the national and international level. He became a party activist while still at school, and served as a county councillor until being elected to parliament in 2007. He was minister of transport, health and later social protection in Fine Gael governments in 2011-2017, and beat Simon Coveney to the party leadership when Mr Kenny stepped down after six years as prime minister. He has promised to "re-energise" the government, but is not expected to introduced any major changes in policy. His main tasks will be to manage the implications for Ireland of the United Kingdom leaving the European Union. Mr Kenny's tenure as prime minister saw the turnaround the economy after the 2008 banking crisis, and some liberalisation of the abortion laws.